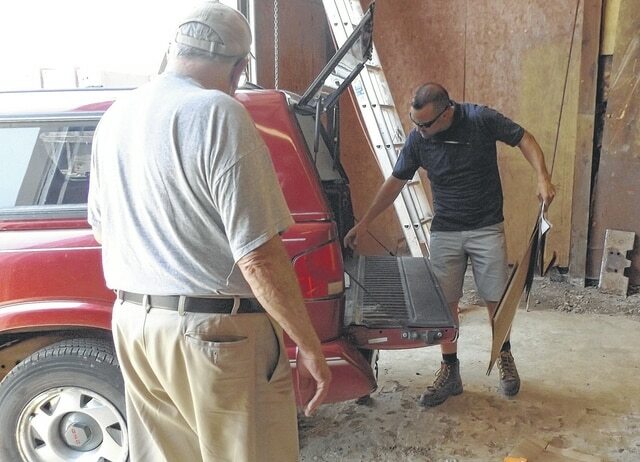 Paul Hunter, left, and Braden Dunham, right, remove cardboard material from Hunter’s vehicle Thursday afternoon. WILMINGTON – The Wilmington Solid Waste Department is in the planning stages of a new recycling program. Sanitation Department Superintendent Braden Dunham said the department will soon pick up recycling from industrial and multi-family residential sources and accept recyclable cardboard dropoffs at the Wilmington Landfill beginning July 1, after awareness materials are distributed. Paul Hunter, a Randolph Street resident and active community member, dropped off the first early load of recyclable cardboard Thursday at the Wilmington Landfill. The materials will be baled at the landfill facility, Dunham said, then stored and sold to the highest-bidding broker. Dunham said the Solid Waste Department received a $190,000 grant from the Ohio Environmental Protection Agency, which was used to buy a recycling collection truck, the remaining funds being reserved for containers. The cardboard recycling issue was partially brought on by Highco, Inc., a recycling company that was a division of the Highland County Board of Developmental Disabilities, transitioning out of the recycling business. Highco provided the Clinton County Solid Waste Management District with a cardboard recycling service, picking up cardboard from a location on West Main Street and taking it down to Highland County where it was sorted, baled and sold. Hunter told the News Journal he frequently used the dropoff location, and noted he saw others using it nearly every time he was there. Highco announced in January they would no longer be providing the service due to its transition out of recycling. In addition to saving his cardboard for a future recycling program, Hunter delivered several presentations to Wilmington City Council addressing the need for a cardboard recycling program. Hunter said Larry Roberts II offered to donate a baler to the effort.